latform screen doors will be installed at all above-ground MRT stations by 2012, more sheltered linkways and barrier-free access features will also be available to make it more convenient for commuters to get to the train stations, Transport Minister Raymond Lim announced Friday. Commuter Mohamad Fairoz and his family are all for the proposed enhancements to the train stations, especially the platform screen doors for above-ground stations, which will help cut disruption and prevent mishaps. “It’s for safety. Sometimes people (are) rushing to go back, so when they rush, they may slip,” he said. The number of track intrusions has risen from an average of 16 cases a year to about 30 in the past two years. 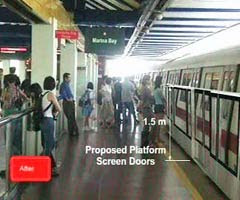 Platform screen doors will be installed at Yishun, Jurong East and Pasir Ris stations in 2009, before rolling out to the rest. By 2010, the Land Transport Authority (LTA) will complete its S$60 million programme to improve access to train stations, and 86 per cent of overhead bridges will be covered. The elderly and less mobile will also be helped. Transport Minister Raymond Lim said the entire bus fleet will be wheelchair-accessible by 2020. Seventy per cent of train stations will also have at least two barrier-free access routes by the end of 2011. A total of S$70 million will be spent to build another 17 lifts at 16 MRT stations. More bicycle parking facilities will also be made available at bus interchanges and train stations from 2009. Starting March this year, the LTA will run a six-month trial to allow cyclists to bring their foldable bicycles onboard buses and trains. Apart from improving train service, the authorities also want to up the service standards for taxis. A common call booking telephone service will be set up by July this year to ensure taxis are available via phone booking during peak hours. The authorities will also promote the use of cleaner and more energy-efficient vehicles, as well as reviewing its Green Vehicle Rebate scheme.